TECUN UMAN, Guatemala — Waving Honduran flags and carrying umbrellas to protect against the sun, thousands of migrants massed along Guatemala’s muddy Suchiate River crossing into Mexico on Friday, demanding to be let in despite U.S. President Donald Trump’s threats of retaliation. “One way or another, we will pass,” the migrants chanted as they moved toward the bridge that connects the two countries as a disorganized crowd of women, men and children. They got as far as a closed metal gate where two military jeeps were parked and Guatemalan police in riot gear looked on silently. “We are not smugglers, we are immigrants!” the crowd shouted as they approached the yellow metal gate. Some climbed atop the gate and the U.S.-donated jeeps as they clamored to be allowed to pass. Dozens of Mexican federal police officers were on the bridge, backed up by hundreds more officers deployed behind it, and Mexico’s ambassador to Guatemala said his country was enforcing what he called a policy of orderly entry in the face of the thousands trying to cross. 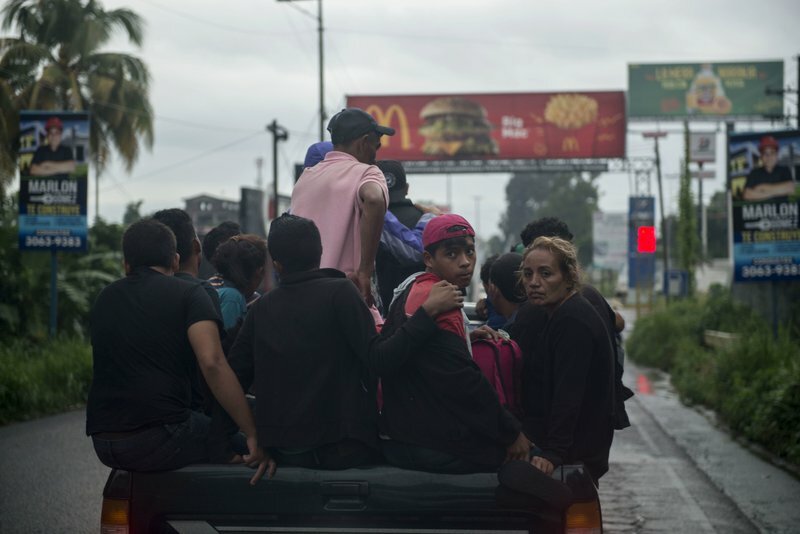 “It is an illegal activity,” said Ambassador Luis Manuel Lopez Moreno, adding that more than 100 migrants had been allowed to cross the bridge to apply for refugee status, including some who were from the caravan and others who were not. Jonathan Guzman, who joined the mass procession caravan en route, said he dreams of finding a construction job in Los Angeles. “It’s the third time that I’m trying to cross,” the 22-year-old Salvadoran said. Those who want to apply for refuge in Mexico will be welcome to do so “if they have a vulnerable situation in their country of origin,” Videgaray said in an interview with the Televisa network. Asked in the Televisa interview whether Mexico was doing Trump’s “dirty work,” Videgaray said Mexico “defines its migration policy in a sovereign manner” and the country’s priority is to protect the migrants and ensure their human rights. He did not seem concerned about Trump’s threat to close the U.S.-Mexico border, saying the threat should be viewed in light of the hotly contested midterm elections in the United States, in which Trump has made border security a major campaign issue.